This particular walk would largely follow a walk I did on my own in August 2017. That one was around sixteen miles long and I distinctly remember the cruel and unexpected ascent required to return to my car. This time, I was walking with company. 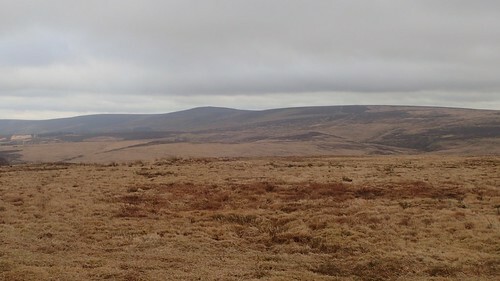 I would aim to reduce the mileage slightly but still introduce the highest point to someone who had never set foot on the moor before. Memorial hut on Horner Hill. We began at the National Trust-owned car park in Horner. 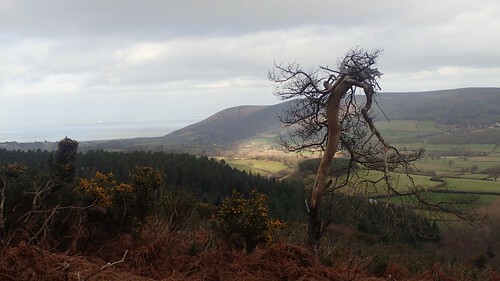 A few miles west of Minehead and a short drive south of the A39. Free parking is available to Trust owners while toilets are open to all. Almost immediately from the car, we began climbing up through the woods along a clearly signed and well-maintained bridleway. 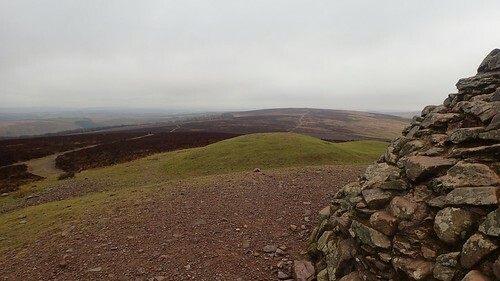 View of Dunkery Beacon from Webber’s Post. A steep beginning to our day but perhaps also, not unexpected, when you’re destined for the region’s highest point. 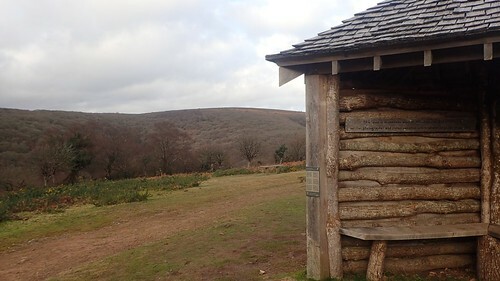 We inspected and passed the memorial hut on Horner Hill before reaching Webber’s Post and its car park [spoiler alert: there is no ‘post’ at Webber’s Post], with a view out to Dunkery Beacon and its surrounding hills. 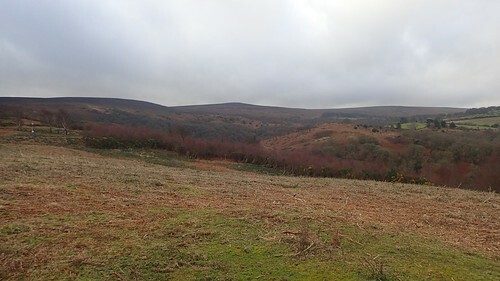 According to the Met Office, the temperature up on the hills would feel around eight degrees less than the mild conditions we’d experienced near the car park. 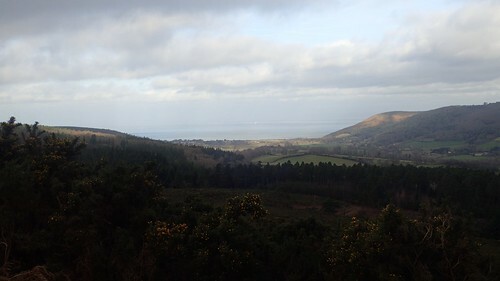 Looking north to Bossington, the South West Coast Path and the Bristol Channel. Away to the north, sunlight draped over the western slopes of Bossington Hill, while we walked on beneath the cloud. 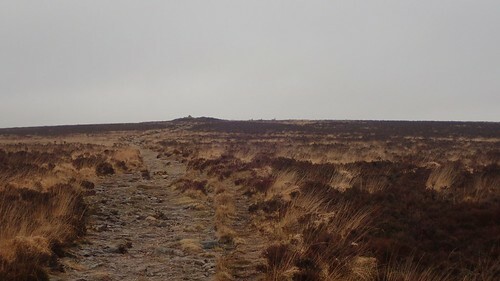 Although we hadn’t seen much rain in the days leading up to this walk – and it had been a fortnight since the first snow fell – we found a few (but not all) of the bridleways to be wet and muddy. 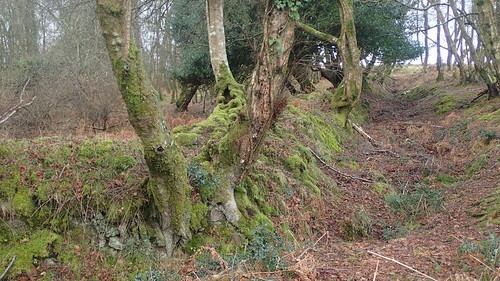 Then, in contrast to this, we found dying trees to our side, walking east along the Dunster Path. 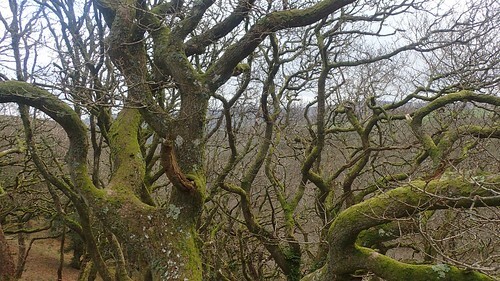 One idea I had from here, would’ve been to head almost off-piste from the defined track and climb north up Luccombe Hill to discover the cairns of Joaney How and Robin How… But my attention drifted in conversation and we were almost at the woods but the time I remembered. People generally are commenting on how early the late-winter/early-spring plants have come to life in 2019. While I don’t think we saw any snowdrops on this walk, there was a lot of life within the otherwise avoidable gorse. 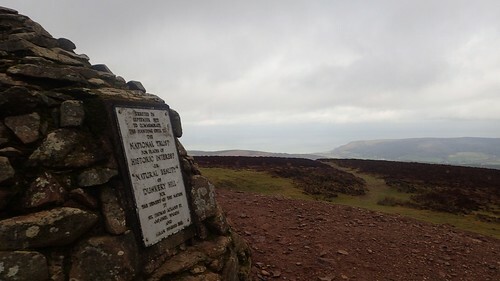 We stopped briefly in the woods and at a path junction, to take on board some snacks and fuel, ahead of what I knew would be a long slog from here, all the way up to Dunkery Beacon. With a respite from the strong wind and gusts, this pause was welcome. Now following the MacMillan Way West in a south-westward direction, we were almost heading back on ourselves. This was had not been the most direct manner in which to approach Dunkery Hill but a good test for endurance and stamina. Far behind us now, were the outskirts of Minehead. 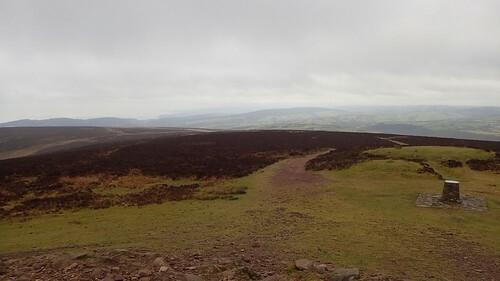 The very long walk to Dunkery Beacon. According to the excellent fingerposts, we would walk a good two-and-a-quarter miles from here and on a constant incline. For anyone looking for an easier trip, there’s a car park at the junction where we crossed a road. 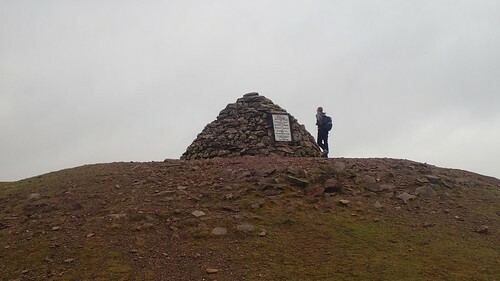 Dunkery Beacon – 519m above sea level. 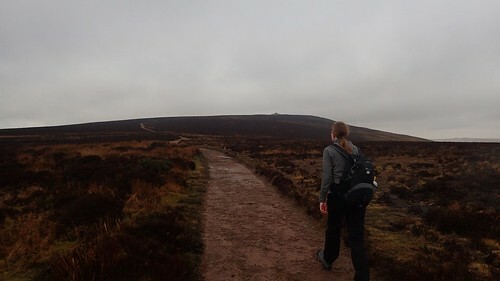 By the time we reached the monument at Dunkery Beacon, the two people who were lingering ahead of us had already departed. Two people on the highest point in Somerset; we had this space to ourselves. On a brighter and warmer day, you can guarantee this place will be much busier. 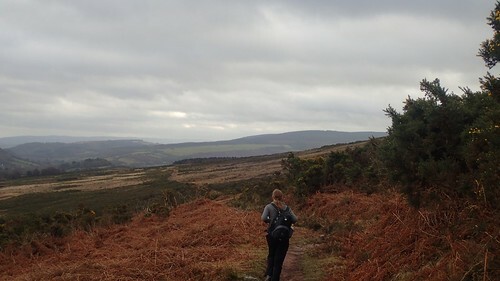 Exmoor is covered with more roads and car parking opportunities than Dartmoor in distinguished footpaths. I remember pausing to equip the jacket and hat from my backpack at this point. We’d done most of the hard climbing for the day and would maintain this elevation for a while. Our walking would continue to the west and in search of the halfway point in our route… Which was set to rise to fifteen-miles, due to my slight lack of attention earlier. We could’ve stuck to the MacMillan Way but instead walk on towards the Rowbarrow cairns. 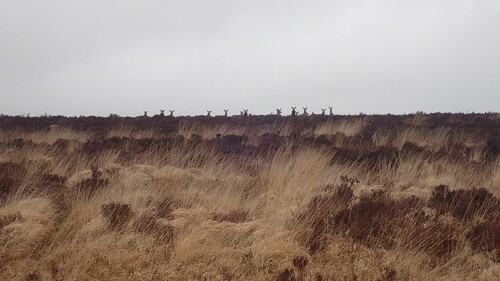 I couldn’t tell what breed they might’ve been from this range but to see them so close, it’s always special… Even though I quite often notice deer each time I come to Exmoor. 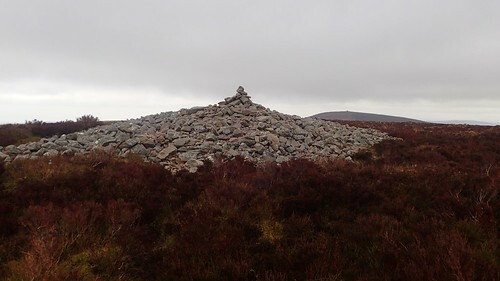 This was one of the significant cairns we visited. 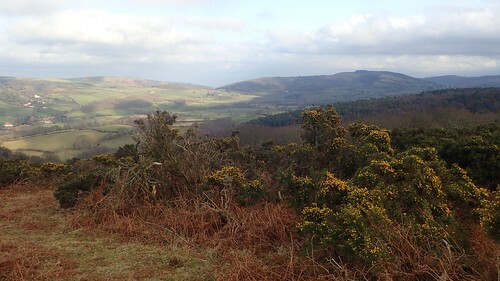 I reckon it was Great Rowbarrow… With a glance back towards Dunkery Beacon. 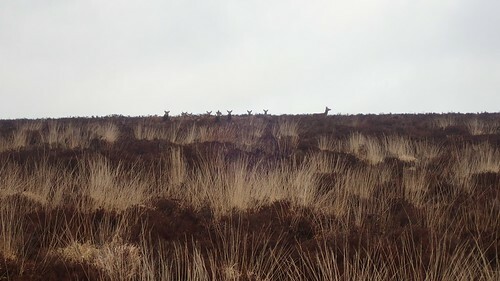 I spied the deer again, on the brow of the hill away to our right. Standing. Staring. Wondering. I’ve always believed that a deer will – whether alone or in a herd – will spot a human long before we might sense them. But to see a whole herd watching over us and not running away… It was again, a very special experience. 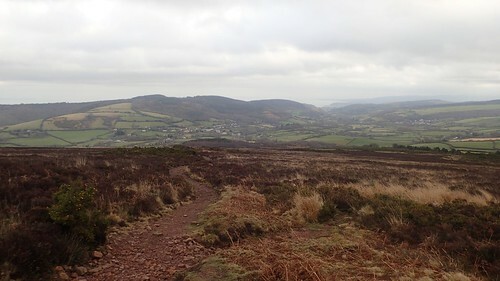 We would cross further roads and moorland from Porlock Post, to reach Almsworthy Common. 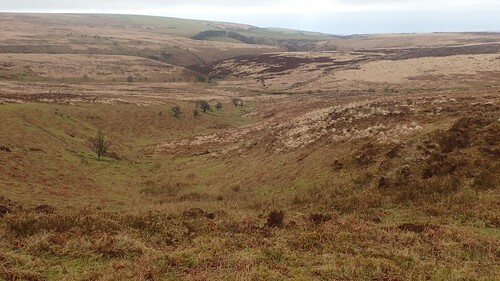 At the western corner of this field, beyond a climb and close to the road and cattle grid, we found a place on which to perch for lunch, with minimal shelter from the prevailing wind. 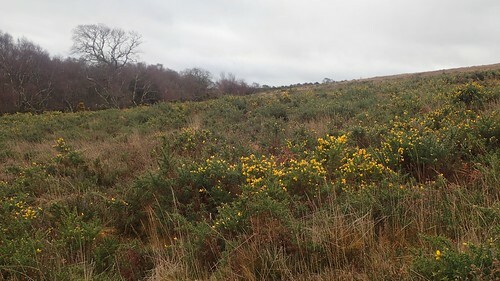 Before this, we crossed Exford Common. 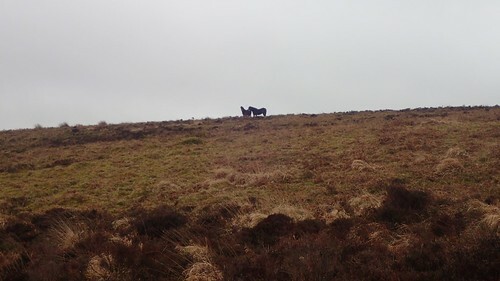 Above which we saw two Exmoor Ponies… The only two that we would notice along our entire day of walking. From near to Alderman’s Barrow, we followed the road north-east to Lucott Cross. We would then join a bridleway all the way to Lucott Farm. This was identical to my previous solo walk in this area but with the distinct absence of sheep and cattle. While following the road, we passed a suspicious number of 4×4 vehicles parked alongside the edge of the road. Each one contained a single male occupant… One held binoculars. It seemed an odd thing, to me. My first instinct was that they could be poachers. I’ll never know for certain but they were clearly looking and waiting for something. 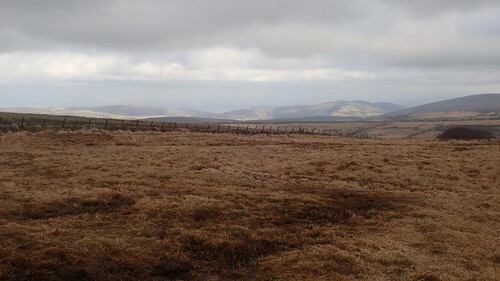 Along with views north towards the sunny coastal hills, we could look back towards our elevated route of an hour earlier; crossing Dunkery Beacon. 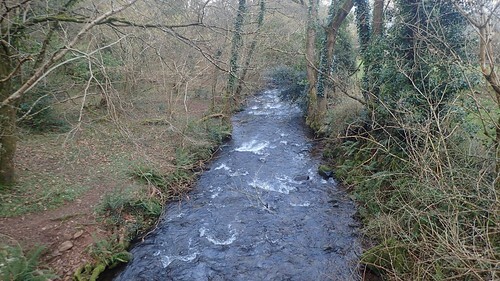 I wanted to take a different path from the farm, where I’d previously continued my descent in to the watery woods of Hawkcombe. 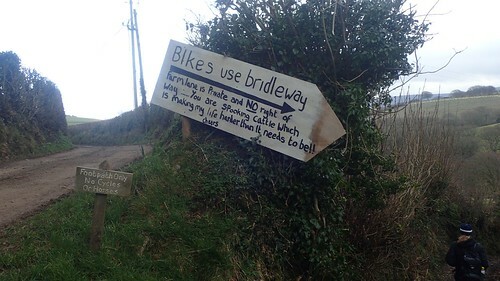 We turned south and then east, where a hand-written sign suggests that some cyclists/mountain bikers have been illegally following the footpath (not the bridleway) that continues along the farm’s private drive. At the end of this next bridleway, we’d reached another road; a short distance south-west of Horner and our end point. My original plan had been to follow the road for a good mile. But, when I saw potential paths crossing open access land to the east and, with the encouragement of my companion, I decided to leave the tarmac and concrete to the cars. 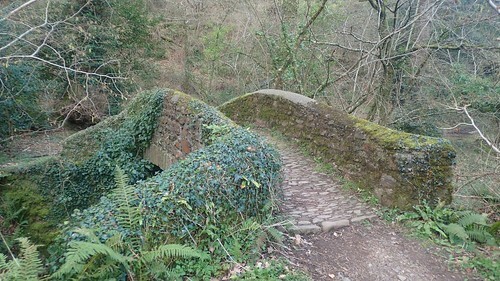 We would successfully find our way down from Ley Hill and in to Horner; briefly rejoining the Coleridge Way, before following a Packhorse Bridge over Horner Water. It was anything but an easy descent and we had to evade the occasional cow, hiding in the bushes. But the views were spectacular, toilets most welcome and it was a great all-round experience to have shared.